Atlantis shuttle astronaut Robert Satcher Jr., STS-129 mission specialist, holds a camera during his mission's first spacewalk of his mission to the International Space Station on Nov. 19, 2009. Twoastronauts, one a proud new dad for the second time, will venture outside theInternational Space Station Monday on the third and last spacewalk of theirmission. Atlantisshuttle astronauts Randy Bresnik - whose new daughter Abigail was bornlate Saturday back home - and Robert Satcher, Jr. plan to spend about 6 1/2hours working outside the station to install a new oxygen gas tank, materialsexperiment and other gear. The orbital work was slated to begin at about 7:18a.m. EST (1218 GMT), but may be delayed a bit due to a problem with the drink bag in Satcher's spacesuit. During hisfirst-ever spacewalk Saturday, Bresnik said the extravehicular activity (EVA) -as NASA calls it - was the second-most stunning experience of his life, rankingjust below the first time he saw his wife Rebecca. But after seeing the firstpictures of his baby girl, he expected that to change. The couple also hasone son, Wyatt, age 3. ?I thinkonce I get to see the pictures today of our new daughter, EVA is going to haveto take a third place,? Bresnik said Sunday. He must wait until after Atlantislands Friday to meet his daughter in person for the first time. Bresnik andSatcher will each make the second spacewalk of their careers on Monday?sspacewalk. The excursion will include the installation of a high-pressureoxygen tank near the station?s airlock, adding a suitcase-likematerials experiment to one of the new spare parts platforms delivered ontheir mission, checking the position of some micrometeorite debris shields andother chores. ?We?relooking forward to that and I?m definitely looking forward to getting out anddoing another spacewalk,? Satcher told reporters Sunday via a video link. Satcher,the first orthopedic surgeon in space, said his medical training has come inhandy. ?My trainingas a surgeon, I think,? 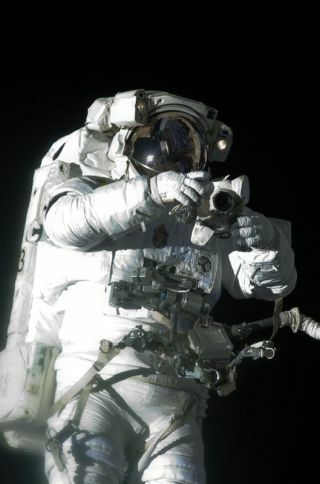 has actually helped me in terms of being able to do thespacewalk,? Satcher said. ?A lot of the point of being able to do a spacewalkis the ability to stay focused and multitask in a strenuous environment, in aspacesuit that is really miniature spaceship.? Monday?sspacewalk is the third and last excursion for the six astronauts aboardAtlantis, who are delivering about 15 tons of spare parts and supplies tothe space station. The astronauts launched Nov. 16 and are due to depart thespace station Wednesday and land Friday at NASA?s Kennedy Space Center inFlorida. MissionControl roused the crew early Monday with the song ?Space Rise? by LarryWhitehair, a friend of Atlantis astronaut Mike Foreman. SPACE.comis providing complete coverage of Atlantis' STS-129 mission to theInternational Space Station with Staff Writer Clara Moskowitz and ManagingEditor Tariq Malik based in New York. Click here for shuttle missionupdates and a link to NASA TV.